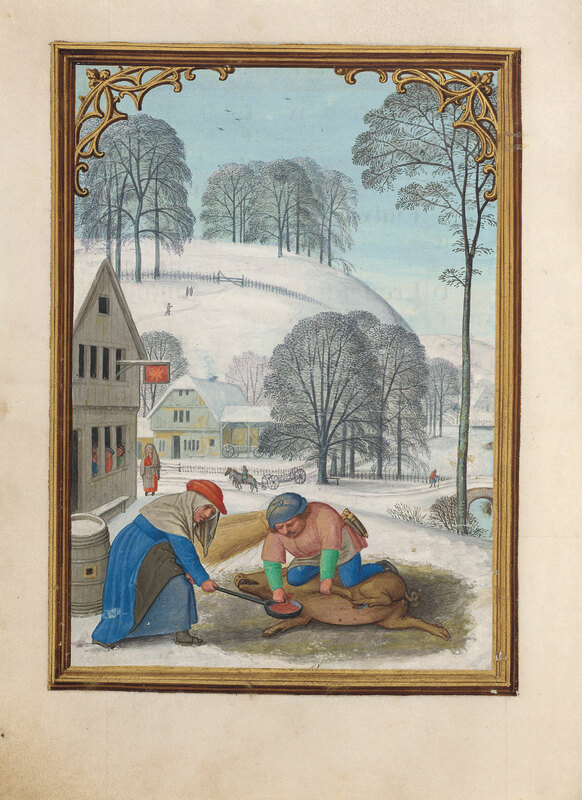 Occupation of the month: December―Within a snowy landscape, a woman holding a pan collects blood from a pig being slaughtered by a man with a knife. To the left, a woman stands beside an inn with a sign depicting a sun or a star. Figures appear in the windows. On the road beyond the inn, a man sits astride one of two horses pulling a cart. Figures appear on a hill in the landscape. The scene is within an illusionistic wood frame. Image courtesy of Akademische Druck- u. Verlagsanstalt, Graz/Austria.